Parens, in Orient - MEISSNER, D.
Title : Parens, in Orient. Map maker : MEISSNER, D.. Size : 3.9 x 5.7 inches. / 9.8 x 14.6 cm. 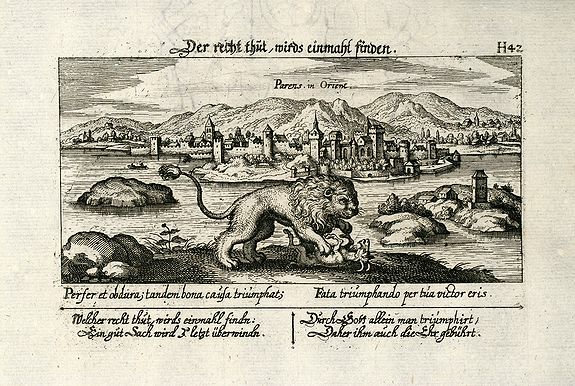 Description :Cooper engraved view of Porec in Croatia from D. Meisner "Sciographia Cosmica" printed 1638 in Nuremberg. With Latin and German aphorism. Condition : Small hole in right margin, excellent condition.